So far we have shared stories of the first year of STEAM. Now that we are a couple of months into our second year of STEAM, it seems the time is right for a more current update. This year we have 28 students in the STEAM un-course – a HUGE growth from last year, allowing for an even more diverse range of student directed projects as students have formed many smaller (but constantly shifting, and often cross-pollinating) groups to work on various projects and problems. We are working on painting poetry with robots. Our goal is to design a program that will parse the text of the Aeneid and assign a mood and corresponding color to each piece of the text, and then that color sequence will send signals to motors with attached paintbrushes and will create a spiral of color, whereas each part of the spiral would correspond to a spot in the storyline of the poem. 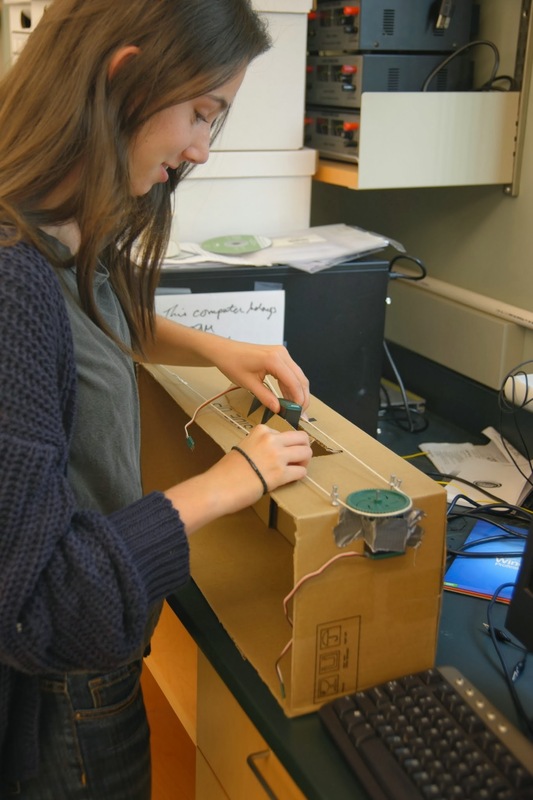 Hannah ’15 works on a prototype of the Poetry Painting Robot. We are working on creating a Rolodex that would randomly shuffle and present prompts that encourage creativity. This concept is embraced by artists, inventors, and entrepreneurs alike, because it helps them grapple and combat with creative block. We thought having a device like this would help foster more creative ideas and projects for the rest of our STEAM community. 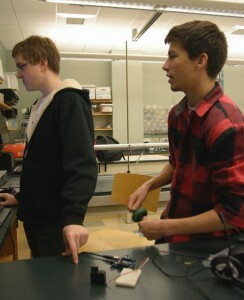 John ’15 and Adam ’15 work on the motor for the Idea Rolodex. We are assembling a data collection kiosk that includes a photo booth that will be used to track emotions of people on campus. While the kiosk is at different locations throughout the year, users will be able to enter and use the interface we designed to input the mood they are in (and can choose to have their photo to be taken). The method for entering data will use Makey Makey to make it interactive and entertaining. In addition to tracking emotional trends on campus, we plan to rent out this booth to student council for events such as semi-formal, prom, etc. to collect student response data. 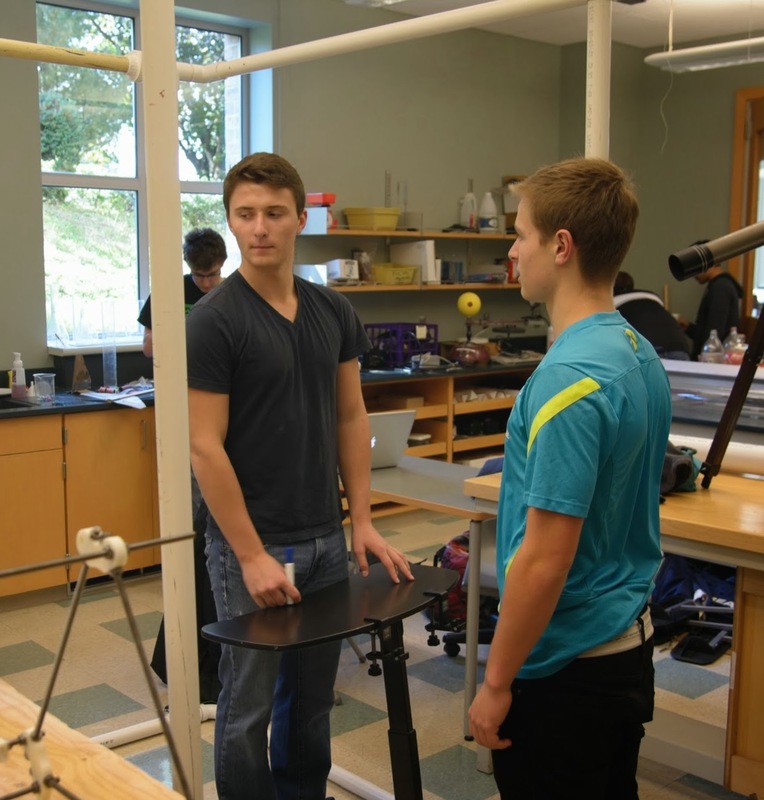 Will ’14 and Will ’14 construct the Mood Booth out of PVC pipe.